The product range of BOLZ Process Technology GmbH is expanded by a „2 in 1 machine“ which sets new standards for pilot plants in the field of process technology. The newly developed BS-pilotDRY® is not only a traditional conical screw dryer, it can also be used as a central shaft dryer. 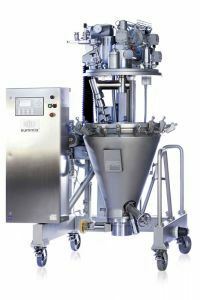 The innovative hybrid stirrer allows drying and mixing processes to be simulated and tested in only one appliance using different mixing tools. Even in times of near-reality simulation techniques, pilot-sized process equipment is still indispensable for the development and refinement of new and existing products. During years of cooperation with companies in the pharmaceutical and chemical industries, BOLZ has continually developed its tried-and-trusted pilot plants which are already in use in many places. The company is thus doing justice to increased requirements of industrial customers for safe handling, completely contained operation, flexibility and efficiency. Mainly, however, they are meeting the demand for devices suitable for use in potentially explosive areas in ATEX zones 1 and 2. To retain the proven mobility of the machines, the dimensions of the pilot dryer have been kept to a minimum. With an overall transport height of 1850 mm and a width of 1400 mm, doorways, corridors and lifts are no problem for a machine with 30 litres nominal working capacity. One special highlight is the newly developed optional hybrid stirrer, which is a registered design. Thanks to the innovative technology, the trial and pilot dryer can not only be used as a conical screw dryer with orbital arm and mixing screw, it can also be used as a single-shaft dryer with a central stirrer. The flexibility of the BS-pilotDRY® saves investment costs and allows the test results of different types of stirrers to be compared directly to one another. Selecting the most suitable stirring mechanism for the product and thus for the future production apparatus is made much easier and much more reliable. The test results are not only useful for production scale-up, they can also be used to further develop, prove or optimise existing or new processes.